‘Better Call Saul’ is very good. But not yet great. I love watching Better Call Saul. Firing it up on the DVR at the end of the day is an act of pleasure, akin to pouring oneself a stiff drink or serving someone else a demand letter. After just nine episodes, it’s already a familiar friend. Its rhythms are at once intoxicating and soothing: the clunk of a cheap watch into a mailbox, the stamp of a validated parking ticket. You can relax into it, slip off your shoes like the McGill boys, and feel the grass between your toes. Saul is more than good. It’s a relief. I rarely say this about a new series. Even the best of the best experience growing pains as the ambition of development collides with the grueling realities of production. You could argue, if you were feeling particularly litigious, that Better Call Saul isn’t exactly a new series. After all, its two central characters are on loan from Breaking Bad, one of the most fiercely beloved dramas of all time — the majority of its writers and directors are, too. The show’s Albuquerque setting is now ingrained into our collective cultural DNA: the broad, meth-blue skies above, the squat strip malls below. But, in inexpert hands, Better Call Saul’s head start could easily have been an albatross. (Do you know how hard it is to get addicts to switch strains? This guy knows what I’m talking about.) So instead of looking back, why not look all around? Better Call Saul’s satisfying consistency is rare among all TV shows in 2015. There are plenty of high-quality series that we stick with out of admiration or loyalty, or stand by out of a perverse sense of obligation. The Americans is my favorite thing on television. But even I will admit it can be agonizing to watch. In comparison, Saul is a cool cup of cucumber water. Saul refreshes. It restores. Which isn’t to imply that any of this is easy. Just the opposite. As the season spins toward its too-quick resolution, I’m struck yet again by Saul’s confident risk-taking. Consider the arc of these nine episodes from a purely structural perspective: the way the Breaking Bad–ness was front-loaded into Episode 2 (Tuco, those stark MacLaren angles, a terrifying ride into the desert) before temporarily receding, like the tide; the way the ebb and flow of cases (from Kettleman to Sandpiper) adds a reassuring gloss of formula to what has revealed itself to be a radically unpredictable narrative. Creators Vince Gilligan and Peter Gould have been pulling all sorts of Heisenbergian tricks with time, jumping backward and forward as circumstances warrant. It’s not enough that the brilliant “Five-O”1 filled in the missing pieces in Mike Ehrmantraut’s move to New Mexico; it also turned the clock back further to Philadelphia, a place where Mike’s implacable competence was as well-worn as a red pleather bar stool. At the time, the series-opening sequence of present day Saul-in-exile felt like a grim period from a sentence yet to be written. Now I think of it as another potential launching pad. 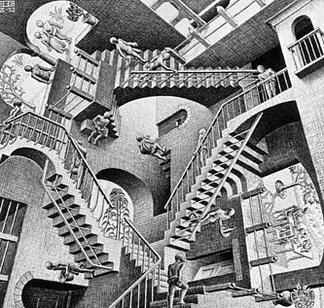 If Breaking Bad’s story was famously a straight line, pointed down, Saul is an Escher staircase of possibility and intrigue. With a show and a character this nimble, Cinnabon no longer feels like a death sentence. As Jimmy could tell you, slipping isn’t the same thing as falling. 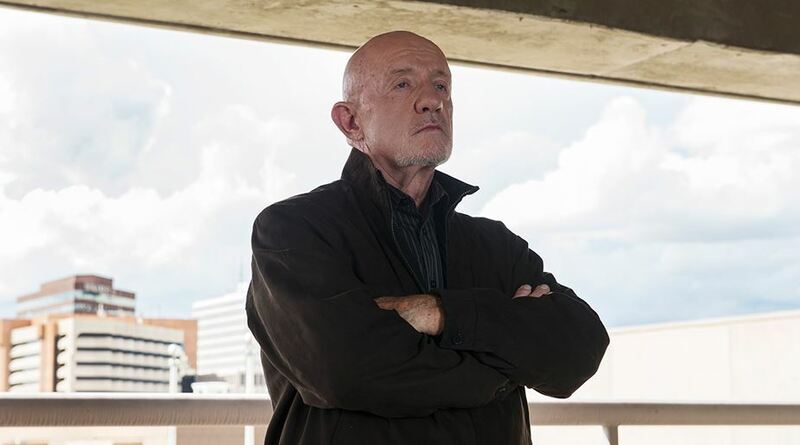 Can we take a moment to discuss Jonathan Banks’s performance at the end of the episode? Did anyone else know he was capable of that? A man who plays a block of ice better than anyone else alive suddenly melted into a raging river. It was like watching Dikembe Mutombo grow tired of defense and start doing this. Gilligan and his writers are a famously humble and unassuming bunch. But Saul has more than a little swagger. It’s a show made by gamblers who know they’re playing with house money. (It felt more than a little confessional when Jimmy announced to the Kettlemans that “The thing you folks need to know about me: I got nothing to lose.”) It’s been electrifying to watch them chuck TV conventions into the Dumpster like so many adult diapers. Episodes have switched protagonists 70 percent of the way through; key relationships, like that of Jimmy and Kim, have been pieced together haphazardly, like a puzzle forgotten for long stretches of time. Saul is a show secure enough in its gifts to allow a fleeting glimpse of intimacy — a shared smoke, a congratulatory hug — to take the place of broad, expository gestures. It’s a world-building crackle that allows the series to soar, even with occasionally rusty material. Last night’s revelation that it was Chuck, not Howard, who had blocked Jimmy’s professional ascent couldn’t have been a surprise to anyone — anyone except Jimmy, of course. And Bob Odenkirk is so good at playing the neediness behind the bluster that the truth, when it finally arrived, rattled like an earthquake. It’s a feat of engineering that Better Call Saul divulged how and why Jimmy McGill came to abandon his family name and embrace the seedier side of the law. But it’s a feat of performance, and direction,2 that Saul made us care so much about it happening. Wow! The direction! That shot of Jonathan Banks and Barry Shabaka Henley beneath the wall of Most Wanted photos! Or Mike boxed in by his parking kiosk and his life! Or the menacing gloom of Chuck’s dining room table! Come on! At a time when superlatives are the new normal, I feel it’s important to say that Better Call Saul isn’t a great TV series — at least not yet. And it doesn’t need to be. It’s a particular joy to revel in Saul’s brand of very good. Though heavier things are always looming — Gustavo Fring didn’t get out of the van last night, but there’s no avoiding that he eventually will — it’s important to appreciate the irresistible, knockaround noir of where we are right now. Saul is already operating in a fictional universe I love dearly, one in which desperate people are forced to rely on little more than what a great improv comedian once called a “particular set of skills.” It’s a place where cab drivers know crooked veterinarians and crooked veterinarians know drug dealers. It’s a place where smoking guns can be pieced together from scraps of paper, an old man can disarm a goliath, and a well-placed black light can illuminate the truth. Unlike the apocalyptic end of Walter White’s reign, Saul’s Albuquerque still has room for fumbling goofballs like “Pryce” and Betsy Kettleman. And, crucially, it has room for Rhea Seehorn, the Bacall of basic cable. Her Kim Wexler — tough but kind; half cynic and half realist — is more than a moll. Like Jimmy, she’s wedged between a world of gangsters and a world of gentlemen, and often it’s tricky to distinguish the difference. As Better Call Saul develops, the gulf between hard work and easy money is likely to widen — yesterday’s bribe is tomorrow’s bounty. So it’s especially gratifying to remember that the show’s creative brain trust seems never to have had to choose between the two. Like the crooked lawyer its protagonist will one day be, Better Call Saul has an interest in truth and a passing familiarity with justice. But what it has above all else is style. And that alone can take you a very long way.